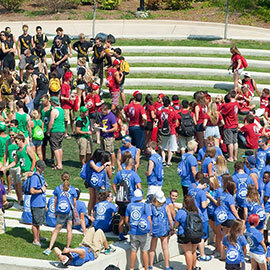 Laurier is in full swing, preparing for the arrival of a new group of first-year students. Here’s what students, parents, faculty and staff can expect during residence move-in days and orientation. Laurier’s Waterloo campus will welcome 4,000 first-year students over the Labour Day weekend. Students will move in and meet their new Residence Life communities on Sunday, Sept. 4 and Monday, Sept. 5. Students can pick up their residence key between 9 a.m. and 2 p.m. in the Athletic Complex on both days. Important information about construction and road closures in Waterloo during the move-in period is available from the City of Waterloo. To make the transition as smooth as possible for both incoming students and local residents, traffic will be temporarily redirected on certain streets. Students are strongly encouraged to check the City of Waterloo site to plan the best route to their specific residence. Once students have settled into their residences or off-campus homes, they are invited to join Orientation Week, a weeklong program run by the Wilfrid Laurier University Students’ Union that includes more than 500 senior-student volunteers. Pre-registered residence students can pick up their Orientation Week kit in the Athletic Complex. Pre-registered off-campus students should go to the Concourse in the Fred Nichols Campus Centre. Details on Laurier Off-Campus University Students (LOCUS) programming are available online. Students who have not yet registered for Orientation Week should go to the U-Desk to register and then to the Concourse. For more information on Orientation Week, visit laurierorientation.com. Among the many Orientation Week activities designed to help integrate new first year students into life at Laurier, student success and academic sessions will provide students with information on how they can successfully transition into university academics and extracurricular activities. The full Orientation Week schedule is available on the Laurier orientation website. Fall-semester classes will begin on Thursday, Sept. 8. Orientation programming on Sept. 8 and 9 has been made flexible so students can attend their classes without missing out on Orientation-Week events. Download the Laurier Students’ Union Guidebook mobile app to access the orientation schedule, an interactive campus map and other important information. The guidebook is available for download with iOS, Android and Blackberry devices. Continuing a more than 50-year tradition, Orientation Week will culminate with Shine Day on Saturday, Sept. 10. During Shine Day, students will wash cars, shine shoes and run barbecues to raise money for Shinerama, which helps fund cystic fibrosis research and treatment. Started at Laurier in 1961, Shinerama has spread to more than 50 universities and colleges across Canada, involving over 35,000 students each year. The initiative has raised approximately $26 million for life-saving cystic fibrosis research and care, with more than $2 million coming from Laurier. Radical Orientation Week, a collaborative effort put on by the Laurier Students Public Interest Research Group (LSPIRG), will run Sept. 6-9 and is free for all Laurier students. Rad Week seeks to provide alternative and political programming alongside Orientation Week events, sparking discussion about important issues like heteronormativity, Indigenous sovereignty, environmental justice, and consent. The week aims to empower individuals with the knowledge and skills needed to take action on campus or in the community about issues that matter to them, while having fun and meeting new people along the way. International Orientation for new international students takes place Sept. 2-5 and is free for all incoming international students. Only students who participate in International Orientation are able to move into their residence on Sept. 2. Registration, which is required, can be done by emailing Victoria Ledezma in Laurier International. Graduate Student Orientation occurs Sept. 6-9 with programming held on the Waterloo, Kitchener, and Brantford campuses. The Office of Student Affairs, the Faculty of Graduate and Postdoctoral Studies and the Graduate Students’ Association (WLUGSA), in partnership with academic programs and departments, will be hosting events that will offer a warm welcome to the Laurier community for all incoming graduate students. The Aboriginal Student Centre (ASC) is hosting an Ice-Cream Kickoff on the first day of classes, Sept. 8, from 3 to 5 p.m. Students are invited to make their own sundae and meet some new friends. Students can learn about the ASC, its staff and all the information they need to know about how the ASC can help with funding, scholarships and bursaries, programming, job opportunities and more. Laurier’s Brantford campus will welcome 575 new first-year students on Monday, Sept. 5. Move-in day will run from 9 a.m. to 3 p.m. with designated move-in times for each residence. Before moving into their residence, students must register in the west lobby of the Research and Academic Centre (RCW), 150 Dalhousie St., where they will also receive their Orientation Week kit. Students living off-campus can pick up their Orientation Week kit at any time during move-in day. Laurier Off-Campus University Students (LOCUS) will have programming taking place during the day before Orientation Week starts. Any students who have not yet registered for Orientation Week can do so in the west lobby of RCW during move-in day. More information on Orientation Week is available at laurierorientation.com. During Orientation Week, new students will take part in several activities, led by a team of nearly 100 senior-student volunteers, which will help them get to know the Laurier community as well as the city of Brantford. Orientation Week programming has been made flexible towards the end of the week, including tours of campus and downtown Brantford, so students can attend their classes on Thursday Sept. 8 and Friday Sept. 9 without missing any activities. The full Orientation-Week schedule with details on Brantford campus traditions like the annual Mayor’s Lunch and Mohawk Park Carnival is available on the Laurier orientation website. International Orientation for new international students takes place Sept. 2-5 and is free for all incoming international students. Only students who participate in International Orientation are able to move into their residence on Sept. 2. Registration, which is required, can be done by emailing Laurier International in Brantford. Graduate Student Orientation occurs Sept. 6–9 with programming held on the Waterloo, Kitchener, and Brantford campuses. The Office of Student Affairs, the Faculty of Graduate and Postdoctoral Studies and the Graduate Students’ Association (WLUGSA), in partnership with academic programs and departments, will be hosting events that will offer a warm welcome to the Laurier community for all incoming graduate students. Brantford-specific orientation for graduate students in Brantford will take place on Sept. 9. The Brantford Aboriginal Student Centre is hosting a welcome back feast on Sept. 15 at 1 p.m. Catch up with old friends, meet new people, play games, win prizes, and enjoy Navajo tacos. Children are welcome.